Governor Bush was the 43rd governor of the state of Florida, serving from 1999 through 2007. During his two terms, Governor Bush remained true to his conservative principles, cutting taxes, vetoing earmarks and championing major reform of government programs. Under his leadership, Florida was on the forefront of consumer healthcare advances, led the nation in job growth, and launched and accelerated restoration of America’s Everglades. In education, Florida raised academic standards, required accountability in public schools and created the most ambitious school choice programs in the nation. As a result, Florida students have made the greatest gains in academic achievement and Florida is one of a handful of states to significantly narrow the achievement gap. Prior to and after his tenure as Florida’s chief executive, Governor Bush was actively involved in the private sector, helping to build the largest full service real estate company in South Florida and owning and operating successful consulting and investing businesses. 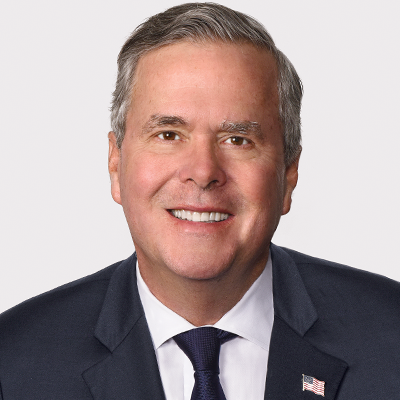 Governor Bush is a co-founder and Chairman of Dock Square Capital LLC, a merchant bank headquartered in Miami and focused on principal investments, strategic advisory services and joint ventures. Governor Bush maintains his passion for improving the quality of education for students by serving as the chairman of the Foundation for Excellence in Education, a national non-profit organization he founded to work with education leaders, teachers, parents and advocates to develop and implement reforms that lead to rising student achievement. Governor Bush has written three books, Profiles in Character; Immigration Wars: Forging an American Solution; and Reply All: A Governor’s Story 1999-2007. He currently resides in Miami with his wife Columba. They have three children and four grandchildren.